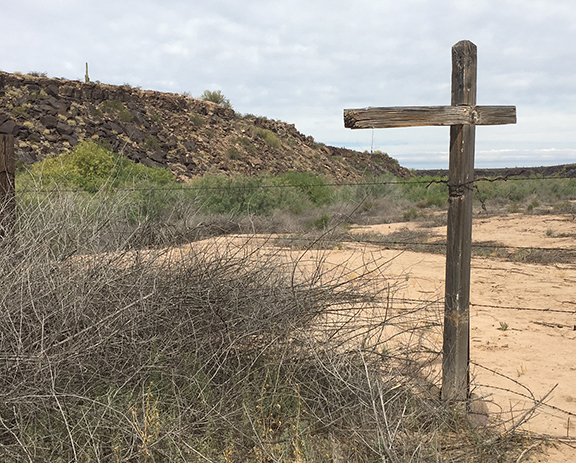 When we last saw Lorenzo Dow Oatman, 14, he and most of his family had been stuck down by Yavapai war clubs on a ridge overlooking the Gila River. Two of his sisters, Olivia and Mary Ann had been taken alive and he had been left for dead after being thrown off a cliff (or jumping himself to ward off the blows). Olive and her brother Lorenzo photographed, probably on the same day, in 1856. 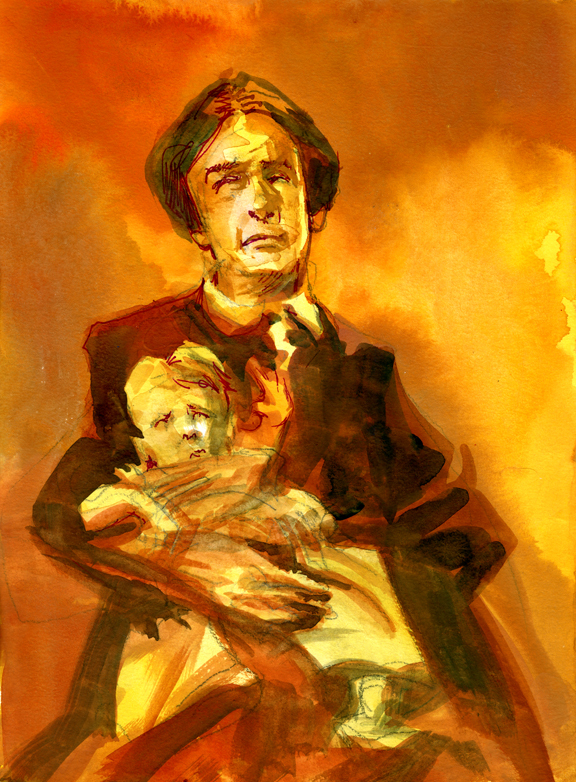 Five years later, he and his only surviving family member, Olive, sat for lengthy interviews with Royal B. Stratton, a charismatic Methodist minister and writer, who intended to tell their ordeal in a book, which ultimately became "Captivity of The Oatman Girls," a national best seller. "I soon determined in my mind that I had either fallen, or been hurled down to my present position, from the place where I was first struck down." 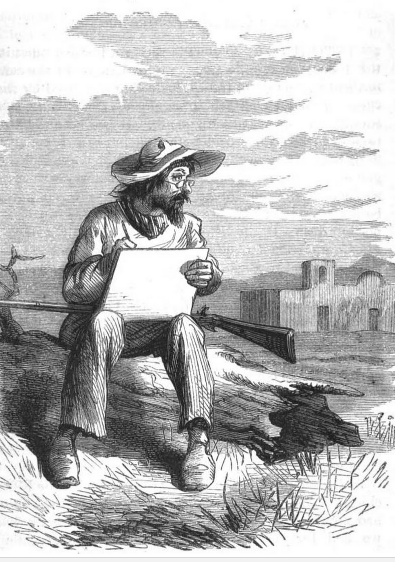 Lorenzo as illustrated in the "Captivity of The Oatman Girls"
A decent illustration of Lorenzo looking back up to the bluff where the stripped wagon stood. One nitpick: the wagon tongue would have been facing the other way, to the west, the direction they were traveling when they were attacked. The actual ridge Lorenzo was looking up at. "I thought at times (being, I have no doubt, partially delirious) that my brain was loose, and was keeping up a constant rattling in my head, and accordingly I pressed my head tightly between my hands, that if possible I might retain it to gather a resolution for my own escape. . .I had no strength to walk, my spirits crushed, my ambition paralyzed, my body mangled. . .I grew sick and faint, dizziness shook my brain, and my senses fled. . .I was conscious of emotions and thoughts peculiar and singular, aside from their relation to the horrors about me. At one time (and it seemed hours) I was ranging through undefined, open space, with paintings and pictures of all imaginable sizes and shapes hung about me, as if at an immense distance, and suspended upon walls of ether." Daily Whip Out: "Lorenzo's Psychedelic Death Trip"
Eventually he stood to walk, but not far, before passing out again. He was harassed by wolves, who he said, came right up him. One can only imagine their morbid delight in finding the smorgasbord on the ridge. When someone finally went out to see about burying them, they found bones and body parts strewn all over the flats atop the bluff. 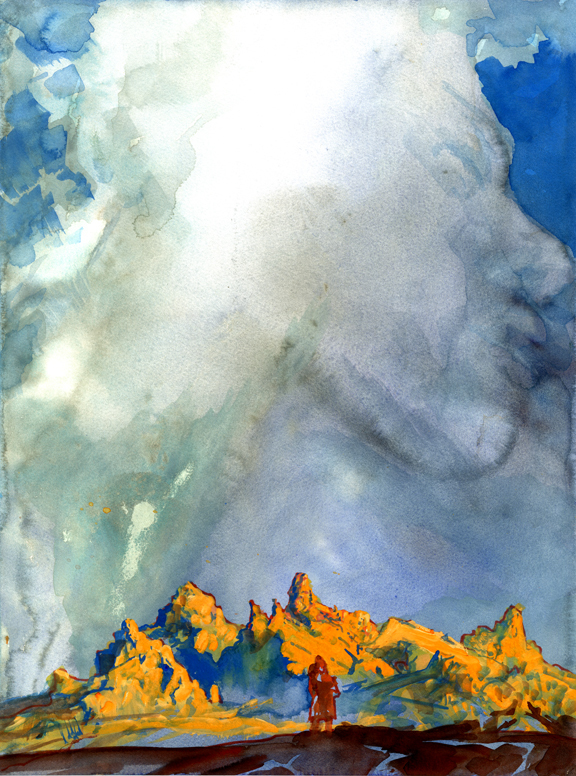 Heading east, Lorenzo retraced the family's route in the direction of Maricopa Wells. On the afternoon of the second day after the attack two riders approached from the Pima villages and they gave him a little food and water. With some effort and help, Lorenzo returned to the Pima villages. He finally reached Fort Yuma on March 27, 1851, over a month after the attack. He was treated by the camp physician, Dr. Hewit, who not only took the boy under his wing, eventually the doctor took Lorenzo with him to San Francisco, where they arrived on June 26, 1851. Bouncing around California from there, Lorenzo never gave up hope of finding his sisters and he was eventually reunited with Olive back at Fort Yuma, exactly five years and four days after the fateful attack on the Gila. "Much of that dreadful period is unwritten, and will remain forever unwritten." When we think of Indian attacks in the Old West, we invariably think of bows and arrows, and then, eventually, tribes get Winchesters and somehow the two get rounded up in a matinee symphony of death, punctuated by the whizzing of arrows and the Ryder Sound track bark of the rifles and the Ind-in's high pitched yells, all melding into a Saturday afternoon double-feature cliche. Corporal Rivera is standing outside the Perfect Conception church near Yuma Crossing when he notices several Quechan men enter the plaza. As the service in the church begins, three of the natives walk towards him holding out a bundle of wood. It appears to Rivera they are bringing a gift of firewood. So, the corporal steps out to receive the gift. The Quechans hand him the wood then pull their war clubs and bust open his skull, dropping him in the dirt, deader than a door nail. At the same instant a great war whoop signals an assault, as a horde of other Quechans pour into the plaza to attack and kill any Spanish person they can find, which they do, quite effectively, dispatching most of them with their trusty war clubs (I believe there is one shooting when a Cuechan utilizes a stolen Spanish rifle). It's known as the Yuma Crossing Massacre and the date is July 17, 1781. Now, fast forward to 1851 and the attack on the Oatmans. Here is Olive's first person description of the attack: "Suddenly. . . a defeaning (sic) yell broke up on us, the Indians jumping into the air, and uttering the most frightful shrieks, and at the same time springing toward us flourishing their war-clubs, which had hitherto been concealed under their wolf-skins." This seems at odds with our popular beliefs about In-din armament. Where are the bows and arrows? Nobody has a knife? 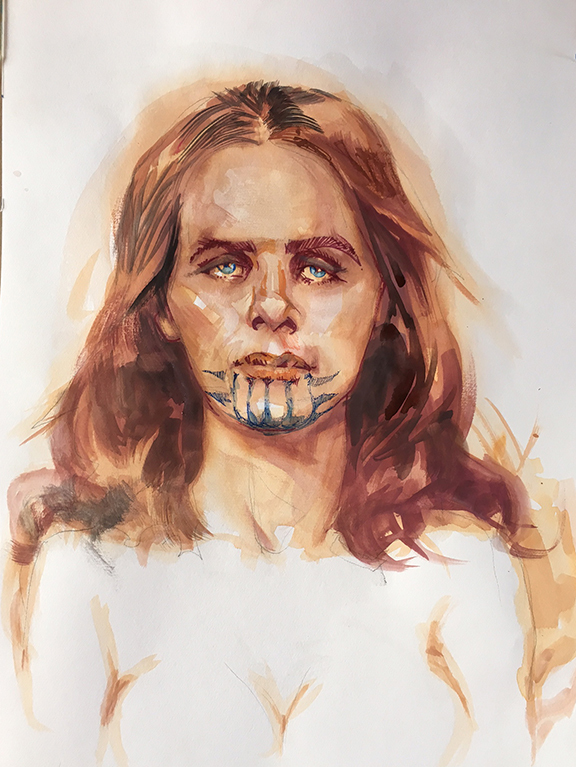 Lorenzo Oatman continues the narration, "I was struck upon the top and back of my head, came to my knees, when with another blow, I was struck blind and senseless." We don't really think about war clubs with the Apaches, who seemed, at least in the popular imagination, to prefer lances and bows and arrows. (and yes, one rifle), circa 1870s. 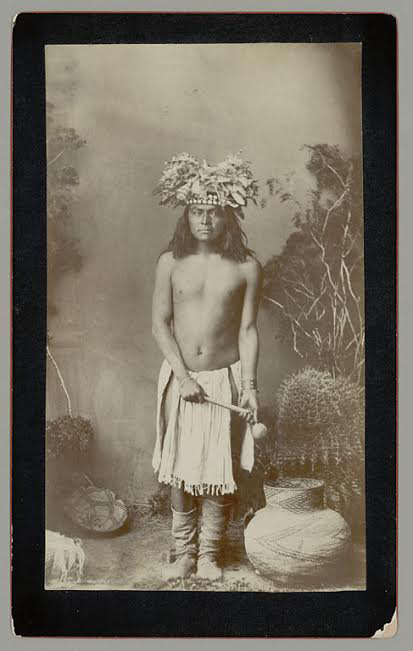 A Frank A. Randall photograph of "Caley in Native Dress" and holding a "skull crusher." Photo is from the National Anthropological Archives, Smithsonian Institution, SPC Sw Apache BAE 69-98, 02011200. 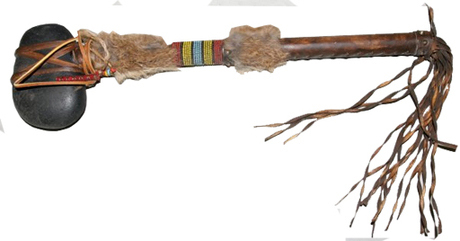 Lynda assures me that in addition to lances and bows and arrows, Apaches carried war clubs and utilized them every bit as much as the Mojaves, Yavapai and Quechans. Plus, for the photo, we need to credit Dr. Robert Watt from England, who is working on a book about Victorio and he is an expert on Apache weaponry. Thank you Dr. Watt! Point of fact, if an arrow landed anywhere in Arizona during the 1800s it was presumed to belong to an Apache. 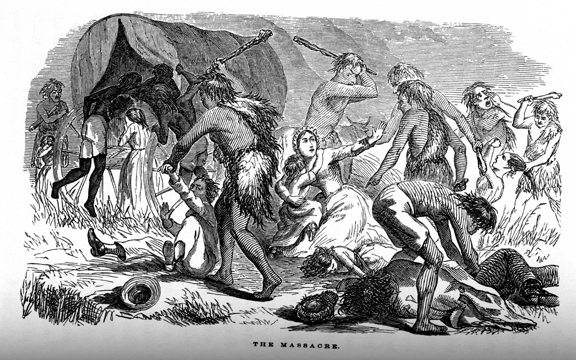 This included the Oatman massacre with Tonto Apaches getting the blame (there's even a map in the book showing the location of the tribe that allegedly did the dirty deed). Map of attack and area of first and second captivity. It was only recently, that author Brian McGinty, in his masterful book, "The Oatman Massacre," questions the Tonto Apache claim. 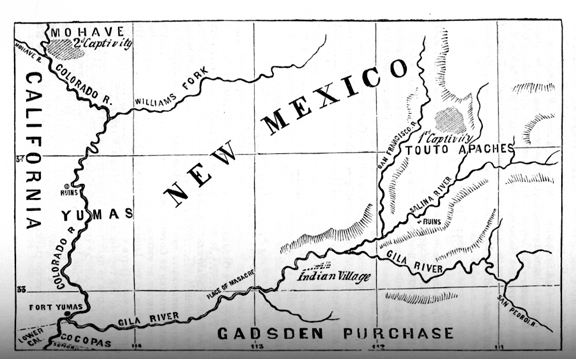 McGinty argues persuasively that the attacking Indians were probably Yavapai, since the Apaches did not traditionally trade with the Mojaves, and that is where Olive and Mary Ann are eventually traded. And the Yavapai were often called Yavapai-Apache, so it is very confusing, but most historians now believe the attackers with the war clubs were Yavapai. Unlike the etching, where it appears the Oatmans are being beaten with tree branches—carried by cave men—I assume the actual war clubs had a rock attached to the end? Either way, they must have had to really swing hard to put a grown man six feet under. Whichever Yavapai warrior had the assignment to brain the 14-year-old boy, Lorenzo Dow Oatman, he must not have had quite enough muscular, force power to finish the job. Daily Whip Out: "Lorenzo Brained But Not Quite Drained"
Here is how Lorenzo describes what happened next: "I soon must have recovered my consciouness (sic) after I had been struck down, for I heard distinctly the repeated yells of those fiendish Apaches." Lorenzo describes the pitiful shrieks and cries of his dying family members. He describes "coming to myself, with sensations as of waking from a long sleep. . .I could not move. I thought of trying to get up, but found I could not command a muscle or a nerve. I heard their preparations for leaving. . .two of the wretches came up to me, rolling me over with their feet; they examined and rifled my pockets, took off my shoes and hat in a hurried manner; then laid hold of my feet and roughly dragged me a short distance, and then seemed to leave me for dead. . .there seemed a light spot directly over my head, which was gradually growing smaller, dwindling to a point." 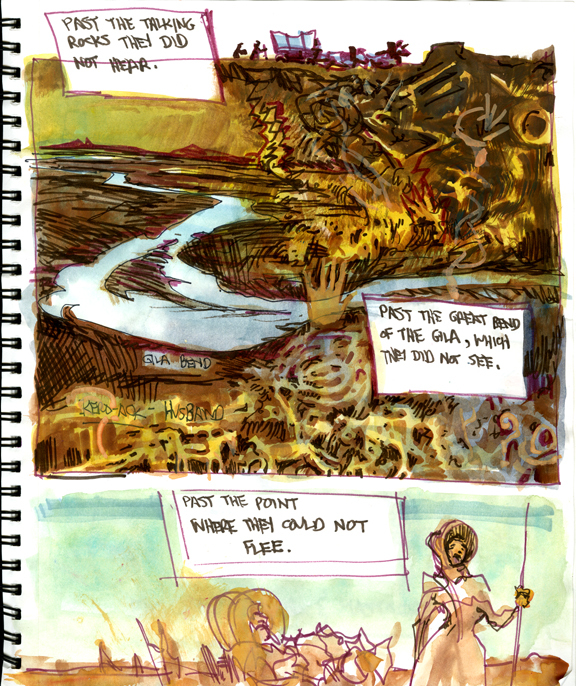 Coming next: we'll track Lorenzo's bizarre, psychedelic trip back to civilization. You can read it right here. "When I was younger I could remember anything, whether it had happened or not; but my faculties are decaying now and soon I shall be so I cannot remember any but the things that never happened. It is sad to go to pieces like this but we all have to do it." 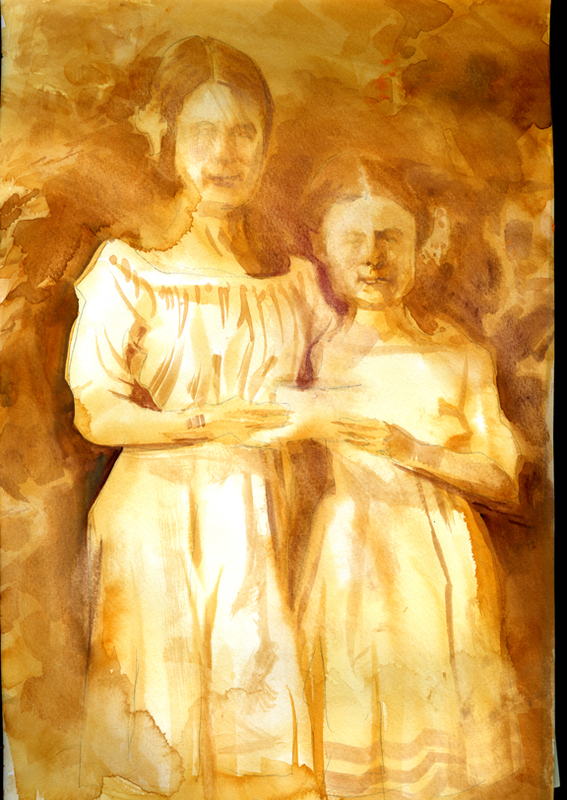 Still trying to capture the Oatmans as they were before being martyred. No, Wait! 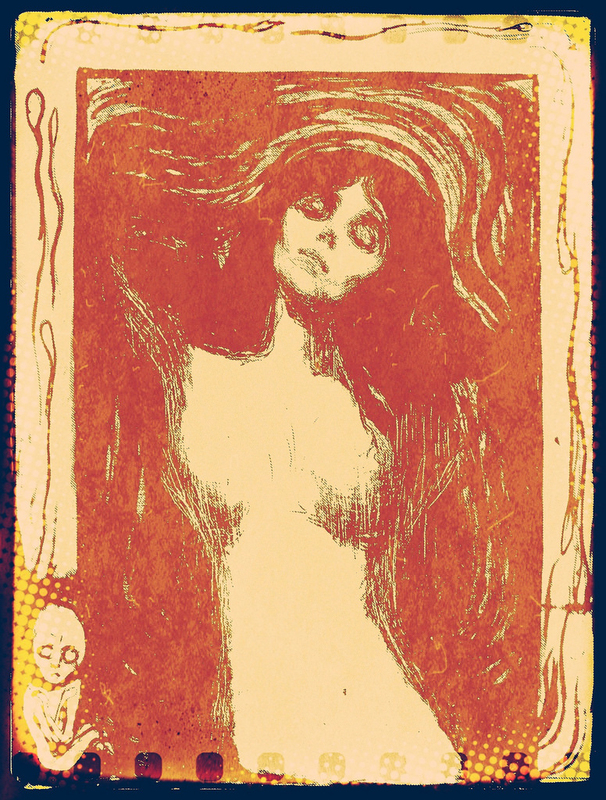 This is Munch's "Madonna"
Still, I see something in there that belongs to Olivia. There is a sadness, a pathos, I'm trying to capture that. Daily Whip Out: "Eyes of Sorrow"
A little too sentimental. 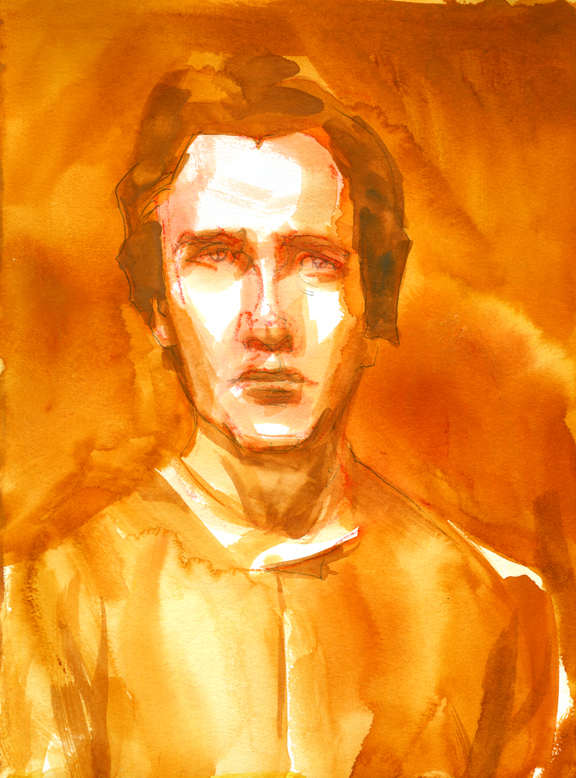 Of course, I have had a run of portraits that didn't quite make the grade. Daily Whip Outs: "Jim Bowies Galore"
I can take some solace in the fact that I'm not alone. 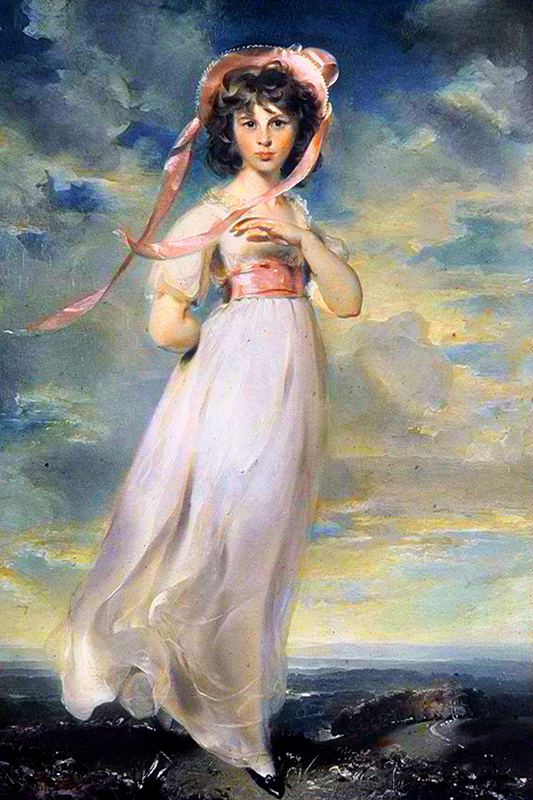 The British artist Sir Thomas Lawrence, 1769-1830, "spoke with disarming modesty about his own art of portraiture, which he felt he had never really mastered; 'I am perpetually mastered by it. . .as much the slave of the picture I am painting, as if it had a living personal existence, and claimed me to it.'" 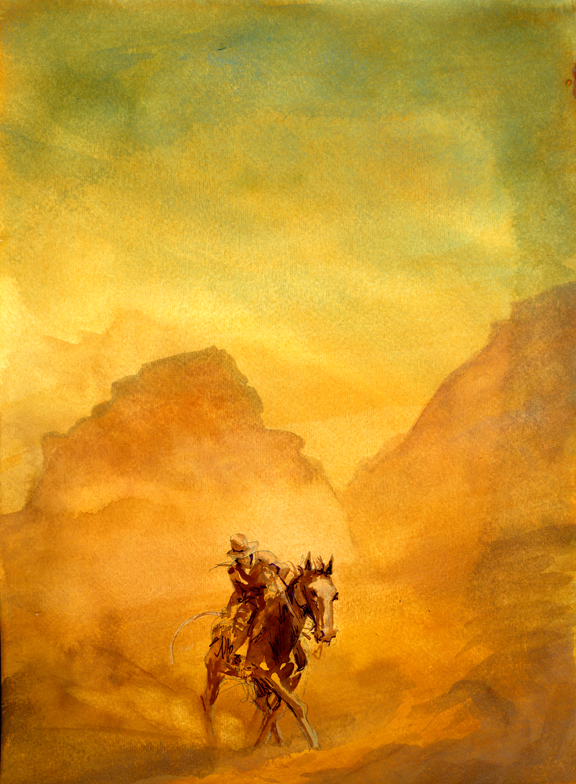 —Richard Holmes, "This Long Pursuit"
Here at True West magazine, Rebecca Edwards designs some great ads. I came back from the Arizona History Conference yesterday and told her I wanted a more "history oriented take" on my book, "The 66 Kid." Check it out. "Any rascal who misspent his youth in the '50s and '60s toting ice for travelers at his dad's gas station in Kingman, got his hand tangled up in a motel washing machine wringer, and lost his virginity in a Nash Rambler, should have one hell of a story to tell about his life and times on Route 66." 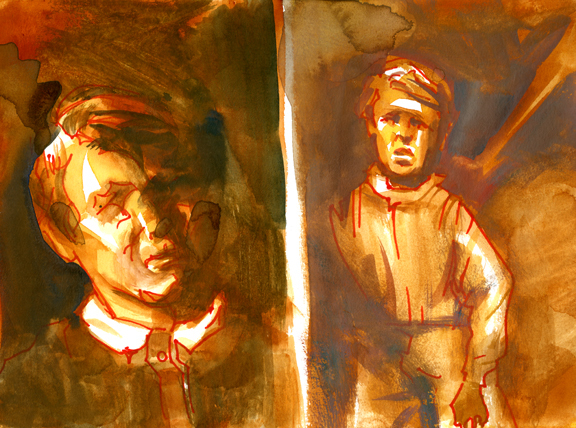 —Michael Wallis, author of "Route 66: The Mother Road"
Had to go home yesterday to meet the plumber and a roof-estimate guy, so I spent the time doing quick, impressionistic studies of the Oatman family, like these. Daily Whip Out: "Lucy, 17, and Royce, 41, Oatman (both killed)"
Daily Whip Out: "Charity Ann, 5, And Mary Ann Oatman, 38 (both killed)"
Daily Whip Out: "Royce, Jr., 11, and Roland, 3, Oatman (both killed)"
Daily Whip Out: "Olivia, 13, and Mary Ann, 7, Oatman (kidnapped)"
Daily Whip Out: "Lorenzo Dow Oatman, 15 (survived)"
Other than Olive and Lorenzo, there are no known photographs of the family, so I tried to channel some of their pioneer grit and innocence, in order to give a face to the tragedy. "I don't want to 'escape' when I read a book; I want to enter a new world that disturbs me." 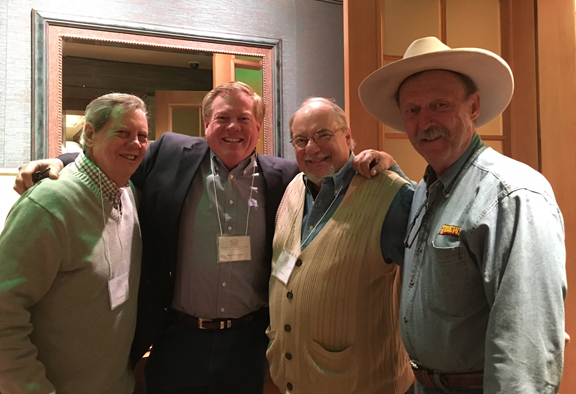 Had a bunch of fun at the annual Arizona History Conference, this year held at Little America in Flagstaff. Myself and the Distinguished Professor, Paul Andrew Hutton, opened the sessions on Friday morning with a one-hour, tag-team talk, about our decades long efforts to capture the enigmatic Mickey Free, at least on paper. The panel was chaired by our book editor, Stuart Rosebrook and a good time was had by all. Fast forward to Friday evening when a book auction was held in the dining room prior to dinner. The proceeds all went to the Historical Society so in the spirit of a good cause, bidding was enthusiastic but restrained and many titles were purchased at levels that can only be described as mercy bids. I personally wanted to leave and go to dinner, but Hutton was beside himself with curiosity about what bid his book would bring, so he and Bruce Dinges, the director of the entire conference, mosied around to the other side of the room so Hutton could see who would bid on his book and more importantly, how much dinero would it bring in. Meanwhile, I reluctantly waited. And waited. And, to be honest, John Langellier bought me a second glass of wine. Most of the titles were going in the $15 to $20 range and for an author like myself, this is humiliating and I didn't enjoy the spectacle or the piddly outcomes. Finally, about 16 titles in, a hardback version of Hutton's book "The Apache Wars" was held up. The auctioneer barely got the first word of the title out of his mouth when I over-dramatically blurted out, "Thirty Five Dollars!" Everyone turned, kind of stunned. I pretended to be a serious bidder, and I was standing next to Jeb Rosebrook on the far side of the room, away from the bidding crowd. As the auctioneer regained his composure and moved along, he mentioned the book was autographed by the author, to which I yelled out, "Okay, ten dollars!" A mild murmur and a couple nervous laughs ensued. When the auctioneer tried to add some accolades to the virtues of the book, I yelled, "I'm sorry, but I'm going to have to cut that down to eight dollars!" I thought it was all good fun and I ended up paying the full $35 for the book. Fast-forward to the above photo, taken the next day in the hallway leading to the history sessions. Mere seconds after this photo was snapped, a short, stocky, middle-aged man tugged at my shirtsleeve at the elbow, and said, "When did you stop being calm?" It was an odd question but I could see he was dead serious. I laughed and said, "Sorry, but I'm not really a calm person." To which he said in a stern tone, "You used to be calm. What got into you, acting out like that?" I knew immediately he was referring to the bidding incident and so, I said, "Well, I'm sorry, but I was just having fun." He walked away with a satisfied look on his face, no doubt pleased that he had taken me down a peg, or two. "Is he still talking to you?" 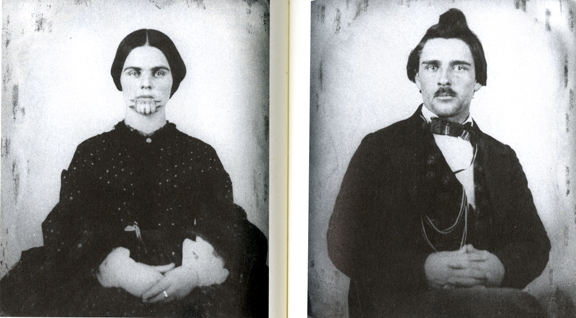 The question has been asked, why weren't the Oatmans more wary on that February day in 1851? 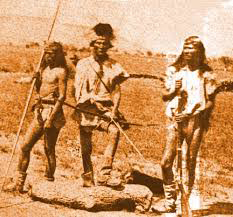 And why didn't they put up more resistance to the Yavapai attackers they met on the rocky trail near Talking Rocks? Daily Whip Out: "Royce's Rough Road of Bad Decisions"
Yes, the Oatmans were wary, but they were also tired and discouraged. 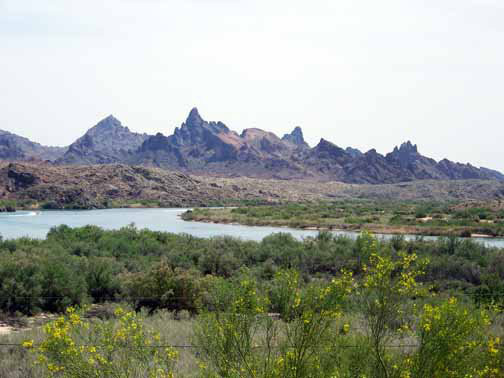 They had tried to cross the Gila River the night before, but their oxen were so weak they couldn't make it across, so the family camped on a spit of sand in the middle of the river and the water kept rising and putting out their meager fire. I don't think they got much sleep. Royce Oatman allegedly cried for an hour in the wagon, probably admitting to his wife what a mistake he had made by pushing on alone from Maricopa Wells where they left behind the last two families who had been traveling with them. 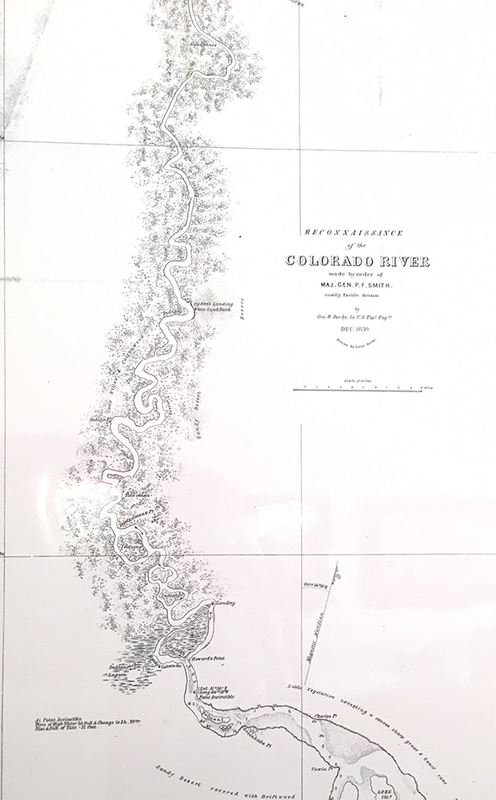 In the morning the Oatmans pulled themselves together and successfully made it across the river, but then they had to make it up the steep roadway to the bluff, where the rough wagon road, leaves the river bottom, and the jaded oxen couldn't make the grade, so most of the family (the mother, Mary Ann was eight months pregnant) had to unload the entire wagon and help push the wagon to the top, then walk back down the grade and bring up all the baggage and equipment, by hand. The oldest boy, Lorenzo, 14, was just putting the last of the luggage back in the wagon when the Indians walked up from behind them. 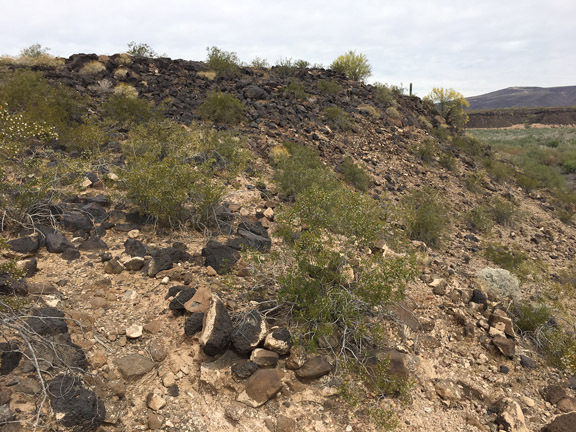 The actual ridge, the Oatmans were trying to climb up on, February 18, 1851. So, yes, the Oatmans were wary but they were also weary and exhausted. When they saw the Indians approaching, Royce told the family not to panic. He had dealt with Indians before and everything would be alright. He would be nice to them and reason with them and they would go on their way. Of course, the raiding party must have spotted the extreme vulnerability of the party immediately (Royce's rifle was in the wagon and he probably didn't retrieve it for fear it would provoke them). As the Yavapais played their hand out, demanding more food, rudely mocking Royce's protestations, they kept pushing the situation farther and farther until, upon getting little or no resistance, they finally made their decision to strike. 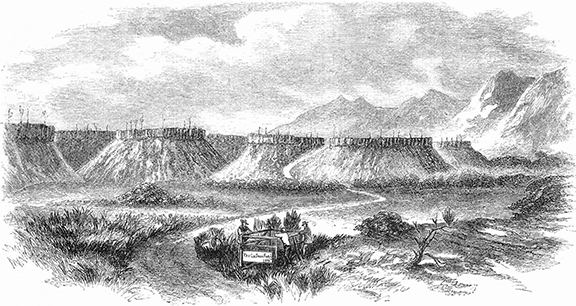 J. Ross Browne's drawing of the Oatman graves in 1864, also depicting the road, in middle background, the doomed family had just climbed. 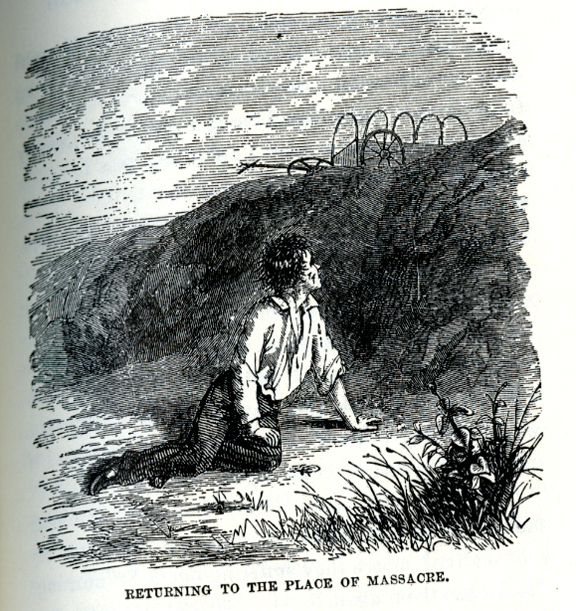 The attack occurred on top of the bluff. "Dr. Lecount (sic). . .camped about thirty miles ahead of us, turned his horses into a small valley hemmed in by high mountains, and with his guide slept until about daybreak. 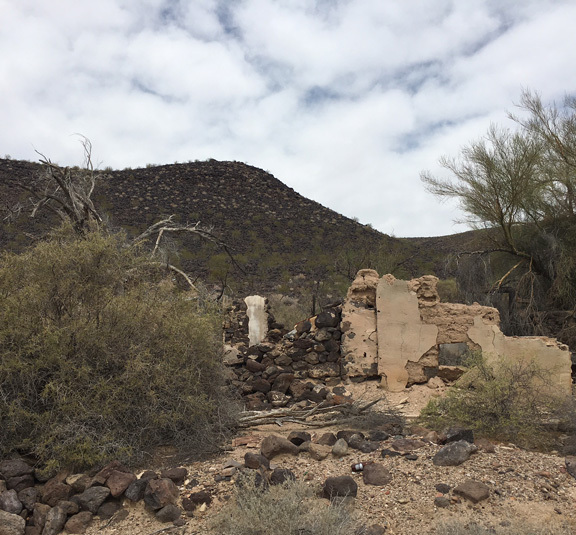 Just as the day was breaking and preparations were being made to gather up for a ride to the fort (Yuma) that day, twelve Indians suddenly emerged from behind a bluff hill near by and entered his camp." Notice, like with the Oatmans, the raiders simply walked into their camp, unlike in the movies where arrows fly and the raiders invariably launch a ferocious and stealthy surprise attack. 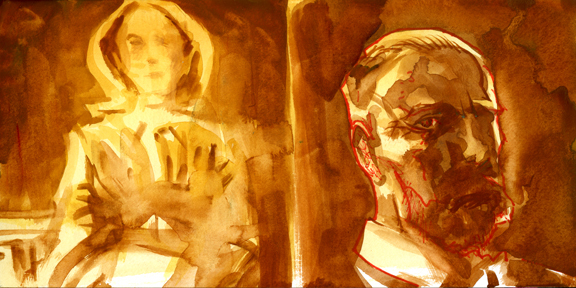 "Dr. Lecount, taken by surprise by the presence of these unexpected visitants, seized his arms, and with his guide kept a close eye upon their movements, which he soon discovered wore a suspicious appearance. 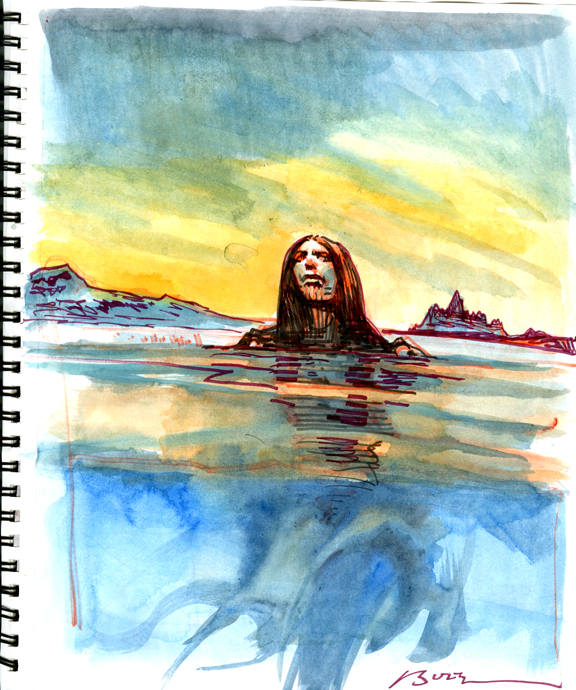 One of the Indians would draw the doctor into a conversation, which they held in the Mexican tongue; during which others of the band would with an air of carelessness edge about, encircling the doctor and his guide, until in a few moments, despite their friendly professions, their treacherous intentions were plainly read." The Yavapais were bold enough to face off with the two well-armed travelers, whereas with the Oatmans, nobody in the family—Royce, or his son Lorenzo significantly—were even holding firearms during the parlay. "At the suggestion of his bold, intrepid, and experienced guide, they both sprang to one side, the guide presenting to the Indians his knife, and the doctor his pistol. The Indians then put on the attitude of fight, but feared to strike." So the raiders crouched like they intended to fight, but then at the last moment backed off. Were they testing the two, or, did they have another objective? 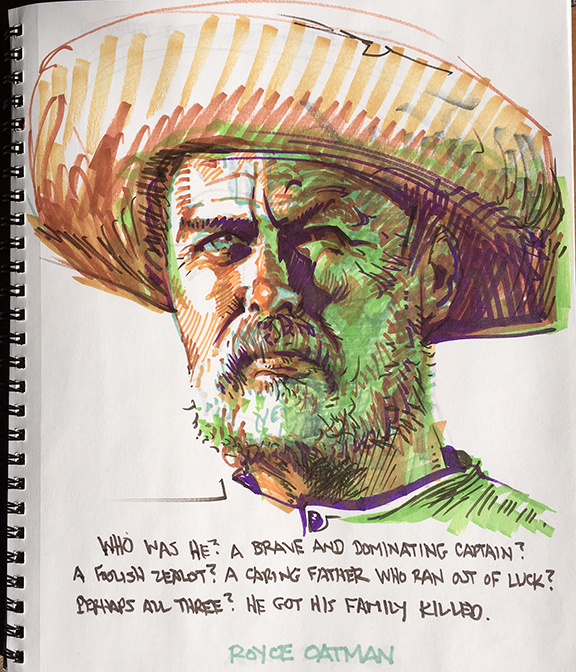 Juan (in the Oatman narrative he is called "Manuel") became "enraged at their insolence, and would again and again spring, tiger-like toward them crying at the top of his voice, 'terrily, terrily!'" This has to be a bad Spanish translation: "terrily"? Could Stratton have meant "Ondelay"? Be on your way! Or, "Get out of here!" Or, perhaps "Terminar," or "Terminala," which according to my Estudiante de Espanole-inclined wife, Kathy, means, "Terminate immediately!" 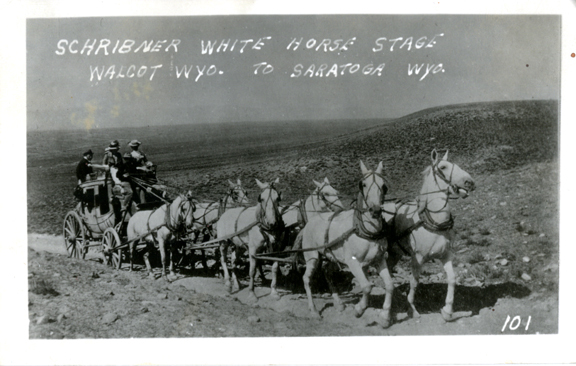 At any rate, the "Indians soon made off," but, as it turns out, the 12 Indians who had engaged with them, feigning a fight, etc., were doing so partly as a distraction so that their comrades could steal the two traveler's "mules and horse." 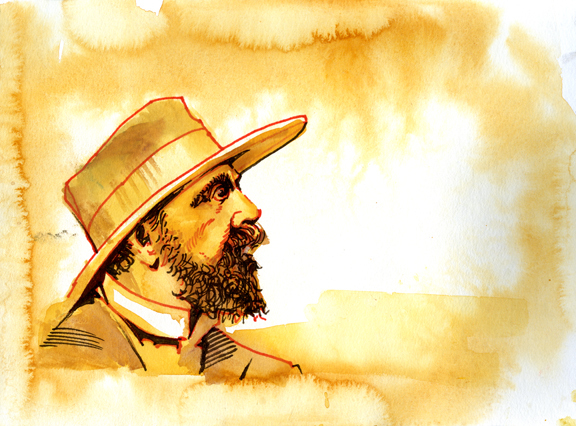 In the Oatman encounter, two days later, one of the Indians mentions two horses down in the brush, which seems to be a reference to this encounter and the stealing of Dr LeConte's mounts. It's more than a little shocking the subtle but significant differences between the two encounters, and how being wary—or kind!—isn't enough. The 17 Yavapais had no problem overwhelming all 9 of the unarmed Oatmans, whereas they were repulsed, or, at least, deferred from their ultimate goal of killing the intruders and taking all their stuff by a guy holding a knife and another guy—a bug collector!—holding a pistol. Sometimes might is, in fact, right. "You can't challenge tradition unless you understand it." 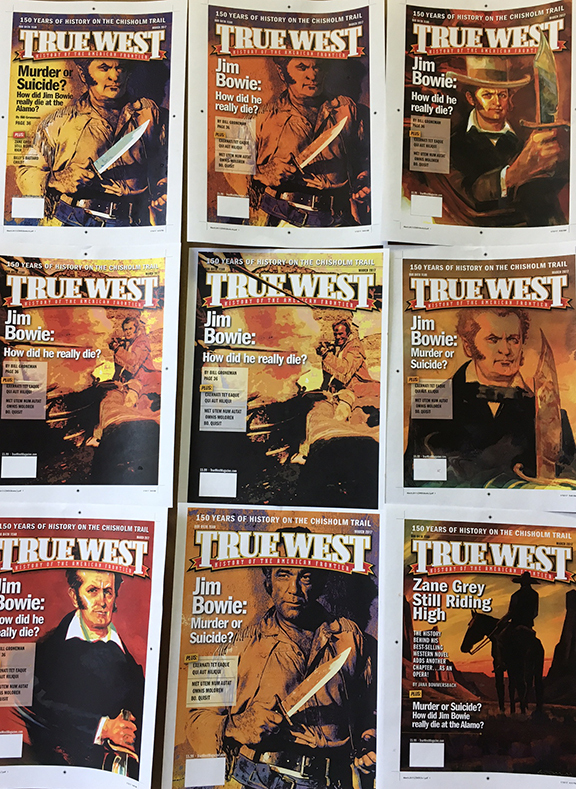 He loved his Family and the West, in that order. Daily Whip Out: "High Above The Needles"
When I was laying in the washes, I thought to myself, "Dang! I remember several years ago taking a photo of The Needles Mountains from just this angle. I wish I had it now!" I was doing a painting of a Colorado steamboat and wanted this distinctive range for photo reference so when Kathy and I were returning from the Arizona History Conference in Laughlin, Nevada, I took the back way down to Needles just to get this shot. Ironically, I'm leaving in ten minutes to drive to Flagstaff for this year's Arizona History Conference. Gee, I wonder what Bob Brink's old classmate at Yale thinks about this? "History gives us a sense of proportion. It's an antidote to a lot of unfortunately human trends like self-importance and self-pity."